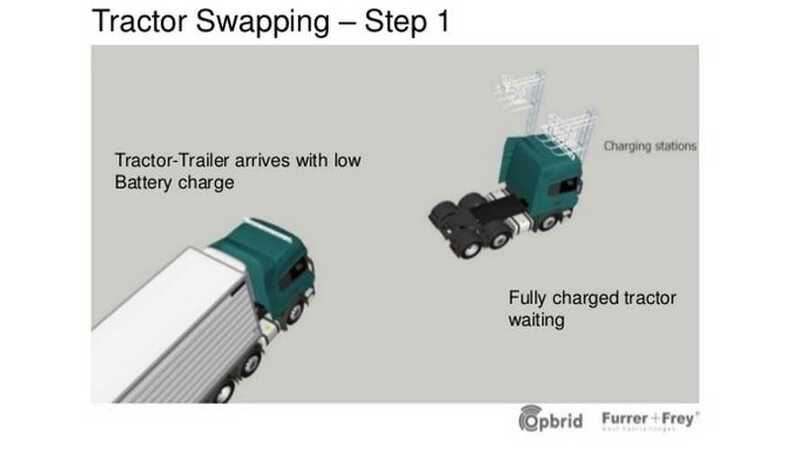 Furrer + Frey, which has acquired the Opbrid, recently proposed a pretty nifty idea on how to electrify long-haul trucking. Instead of overhead catenaries, inductive charging while driving, fast charging along the route, or battery swapping, Opbrid is considering swapping whole tractors (it would seem they are definitely Formula E fans - which utilize the same principle). 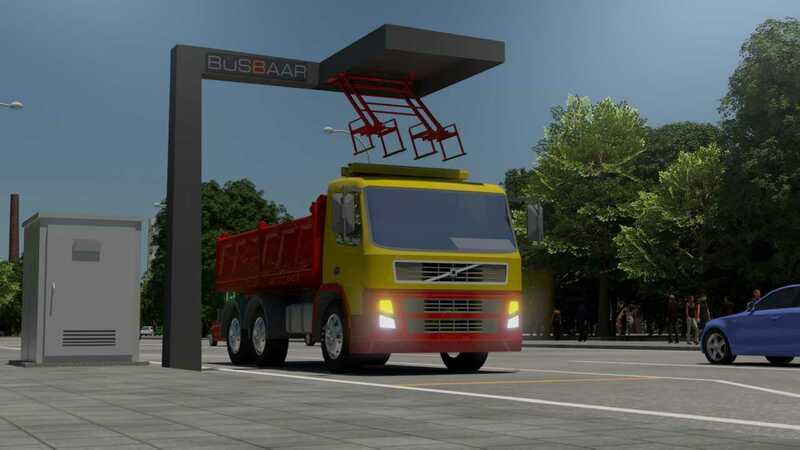 "Under the proposed tractor swapping model, a tractor-trailer with a low battery charge would pull into a station where a fully charged tractor is waiting. The driver switches tractors, and departs with a full pack. The first tractor then recharges." To facilitate the swap, Opbrid would like to make the process automatic (with some driver assistance). Charging power at the stations would be up to 650 kW, while the battery packs needed for about 200 km (120 miles) of heavy load driving would need to be about 400 kWh. Jost KKS automated coupling system. This is a fully automatic driver assistance system that controls all functions of the coupling and decoupling process that have previously been performed manually. This also includes the first automated interface for pneumatic and electric connections. Furrer + Frey Opbrid Trůkbaar. The Opbrid Trůkbaar is designed for ultra high power mode 4 DC charging, up to 650 kW. This amount of power transfer uses the conductive technology transferred from the European electric rail industry by Furrer + Frey. This amount of power transfer enables scenarios such as super short charge stops and 24-hour operation. Need for precise scheduling to avoid idle tractors. Installation on the KKS system on participating tractors and trailers. Delays can propagate through the system—similar to delays in air travel. The business model favors large shippers.